Online shooter games put the gamer behind the gun and allow most gamers to live a life that they could only experience through the click of a mouse or few pushes of the keyboard’s buttons. Shooter games have advanced over the years. What once started out as a small, single rifle shooting game intended to hunt those pesky ducks has turned into a world of realistic army weapons and hunting down enemies from out of this world aliens, zombies, and even other human enemies. With the hundreds of online shooter games that are available for gamers, it is best to limit the list down to the top eight online shooter games. Here is a look at the diverse range of online shooter games and some of the best shooter games to try out. Rambo Bros isn’t the traditional first-person shooting game but it does allow gamers to take a humorous approach to shooting games. Play as one of the famous video game brothers and work your way through worlds by shooting and eliminating enemies with a number of weapons. You cannot get more realistic than playing a game that was developed for the United States Army. America’s Army allows gamers to choose through realistic army weapons and work their way through the ranks of the army. 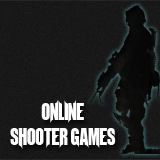 One of the most detailed online shooter games available to gamers. You will be able to choose from a number of weapons to use while you make your way through a maze of complex worlds hunting down the enemies. A very realistic first-person, multi-player shooter game that takes place online. Gamers are placed in realistic settings and environments where they will face off against other enemies played by various gamers. This game is based off of the Cube engine which adds more detail to the game. Nexuiz is a fast paced, first-person shooter game that runs as an open source game. This fast paced game sets gamers in the traditional fight to the death match against various players where the strongest person or the one with the most powerful weapons will win. The living dead have come to take over the world and eat you alive. Your mission in Zombies of Shadows is to control this first-person shooter game and destroy all the undead before they make you their next lunch. Combine science fiction elements with first-player shooter games and you get Alien Arena. Gamers are put into a sci-fi world where they take the likes of aliens and work at eliminating the enemies with state of the art weapons. Warsow is a detailed first-person shooter game that takes gamers into the high cyber tech world. Instead of focusing open multiple weapons gamers perform acrobatic jumps to avoid enemies while they control the shooting. From taking down the undead before they make a snack of the human race to taking on an alien form or fighting off realistic enemies, there is an online shooter game just waiting to put you behind the weapon and transport you into a whole other world. the xbox version, and actually the pc version too of america’s army are the best in online shooters from the time they just got out, counterstrike is a classic but not as good in my opinion. I really like shooting games against zombies. The first Zombie Apocalypse game I have played is Resident Evil and I still want to play it if I could but there are just no other versions available other than the PSX one. Thank you for the post! Great info. I used to spend alot of my time yachting and being involved in sports. It was most certainly the most memorable period of my young life and your info kind of reminded me of that. I recently tweeted and stumbled upon your post. Really your post is very informative and I enjoyed your opinions. Do you use twitter or stumbleupon? So I can follow you there. I am hoping you post again soon. Sounds you are into FPS games a lot :D. Well the games listed here is only for playing online, and the PC version will be way better, no doubt!